Yes that’s what I’ve concluded after reading this study, appearing in JAMA Pediatrics. Screens. They are everywhere. The average 0-8 year old in the US spends about 2 hours per day watching a screen of some sort or another, and that number seems to be increasing. As a good physician, I am concerned about screen use – cross-sectional data has suggested that kids who spend more time on screens do worse in school and have slower developmental milestones. There I go, warping young minds. But as a bad parent, I am thankful that sometimes after a long day of work I can put on the TV and have my 3 kids veg out while I decompress. Here’s a picture of my younger two eating processed food, and watching screens while I stand nearby, not enriching their lives in anyway. Up until now, I’ve justified this behavior because these prior cross-sectional studies couldn’t assess causality. Sure – maybe screen time hinders brain development, but maybe kids with developmental problems watch more TV, right? Well, maybe not. The JAMA Pediatrics study gets closer to causality than we’ve ever been before in terms of assessing whether screens can be harmful. Here’s how it worked. Researchers used data from the All Our Families study, a longitudinal cohort study of mothers and children in Calgary, Canada. There were 2,441 children in the study, who were followed from birth to 5-years of age. At yearly visits, mothers were asked about screen usage and were administered the Ages and Stages Questionnaire – a validated survey that assesses child development across multiple dimensions. 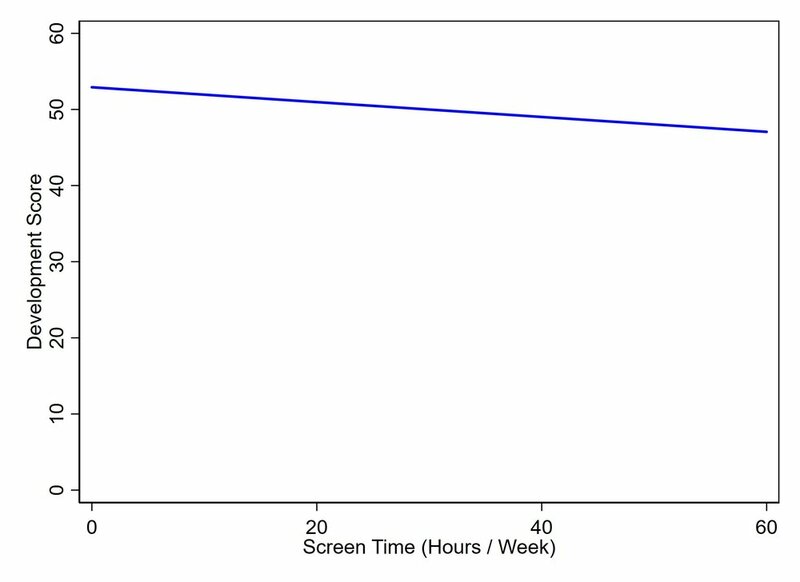 Though screen use varied with age, it was pretty high ranging from 1.6 to 3.6 hours per day. And, cross-sectionally, kids who were exposed to more screen time had worse scores on the developmental assessment. Full disclosure, I had to do some back-of-the-envelope math to convert the statistics in the paper to reasonable numbers, but I think this is pretty close. Like the ratings of Dexter over time. Thesis committee: Um… sure. This seems right. That finding doesn’t add much to the existing data. But the researchers went farther. They used a technique called random-intercept crossed-lagged panel modeling to tease out the direction of causality between screen time and development. It’s complicated. But basically, since the kids were followed over time, the researchers could ask two questions. 1) Did screen exposure at a younger age associate with slower development later and 2) did slower development at a younger age lead to more screen time later. For each extra hour of screen time per day at 24 months, for example, developmental scores at 36 months were 0.3 points lower (on a 60 point scale), a statistically significant difference. Whereas there was no relationship between developmental score at 24 months and screen use at 36 months. This is fairly compelling evidence that the direction of causality is pointed pretty squarely from screen time to slower development. But bad parents like me should not fear that their precious 30 minutes of quiet time after dinner need to be thrown away recklessly. First, the overall effect here is really small. Even twenty extra hours of TV a week would decrease development scores by only about a point – which may not be clinically significant. Second, there was no breakdown of the TYPE of screen time. Screen time can be interactive and social or totally passive. It can be mindless or surprisingly informative (I’m looking at you, Magic Schoolbus). Finally, there was an almost equally strong association with maternal depression and developmental scores, which supports an argument that I’ve made a lot when it comes to child-rearing – that parental sanity is important for child development, and if taking a break from your kids for a bit helps with that, well it may just be worth it. Nevertheless, as a physician, I feel the need to say – we should all encourage our patients to spend time with their kids, play with them, help their little minds develop the ability to interact with real-life people. And if you’re a bad parent like me, remember, it’s never too early to start building critical card counting skills. Little shark cleaned me out.